DOJ REPORT BLASTS BALTIMORE CITY POLICE: The Sun reports a series on the Department of Justice report on Baltimore City policing. Carrie Wells writes about the 163-page report that details abuses. Jesse Coburn writes that the DOJ found that police unnecessarily used tasers. Catherine Rentz writes about the department’s inability to police itself and root out problems, according to the DOJ report. You should be able to access the report here, at the New York Times. Reacting to the release of the Justice Department report: Baltimore Police Commissioner Kevin Davis, Mayor Stephanie Rawlings-Blake, and Vanita Gupta, head of the Civil Rights Division. From the mayor’s Facebook page. REACTION TO DOJ REPORT: State Sen. Catherine E. Pugh — Baltimore’s Democratic nominee for mayor — said Wednesday she wants Commissioner Kevin Davis to lead city police through the years-long process of reforming the embattled agency. Pugh said Davis has demonstrated a willingness and ability to improve the department, and she would keep him in place as long as he involves the public, especially African-Americans, in the department’s overhaul, writes Yvonne Wenger for the Sun. Former Maryland Gov. Martin O’Malley sidestepped questions Wednesday about his policing strategy during his time as mayor of Baltimore, a day after the U.S. Department of Justice delivered a blistering critique of the “zero tolerance” policies he adopted to quell spiraling violence in the city at the time, writes John Fritze for the Sun. The Justice Department investigation that laid bare a history of unconstitutional and discriminatory police practices in Baltimore drew sharp responses across the city Wednesday, including disgust for the tactics and reproach for the leadership that allowed them to take root. Kevin Rector of the Sun interviews state and local politicians, former police officers and civil rights activists. 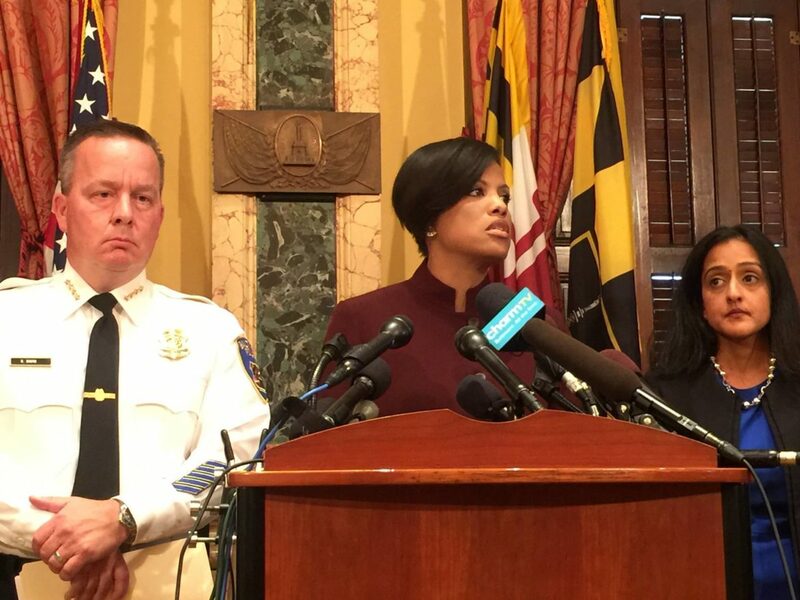 Fern Shen of Baltimore Brew reports on Mayor Stephanie Rawlings Blake’s reaction to the federal probe of her police department, which she initially resisted. Heather Cobun of the Daily Record reports that the Justice Department’s blistering report on the Baltimore Police Department’s practices has brought national attention to the ways officers systematically violated the rights of citizens. But for attorneys representing those citizens in civil lawsuits against police, the conclusions were not surprising. The editorial board for the Sun opines that the problems with the Baltimore City Police Department are more and deeper than what Mayor Stephanie Rawlings Blake characterized as a few bad apples. POLICE DEPARTMENT REFORMS: The task of trying to reform Baltimore’s police department in the aftermath of a damning U.S. Department of Justice report will largely fall to the police commissioner, and the next mayor and state legislature, reports Adam Bednar in the Daily Record. ELLICOTT CITY GETS DISASTER DESIGNATION: Gov. Larry Hogan said Wednesday that the U.S. Small Business Administration has approved his request to declare Howard County a physical disaster area following a flood last month in Ellicott City that killed two people, destroyed a half-dozen buildings and caused extensive damage to many others, reports Ovetta Wiggins for the Post. Federal officials have declared Ellicott City a disaster area, a designation that will make residents and businesses eligible for federal aid and potentially pave the way for reimbursement of state and local expenses, Bryan Sears of the Daily Record reports. MVA EXTENDS ID DEADLINE: The Maryland Motor Vehicle Administration has extended the deadline for more than 260 commercial driver license holders — most of them immigrants — to prove U.S. citizenship or permanent residency before their driving privileges are canceled, Arelis Hernandez reports for the Post. TAX FREE WEEK: Shoppers can save on sales tax during Maryland Tax-Free Week, which begins Sunday and runs through Saturday, Ovetta Wiggins of the Post reports. Comptroller Peter Franchot (D) has been promoting what he calls the “second most popular” shopping week of the year in Maryland by stopping in stores across the state to encourage shoppers to take advantage of the deals. CRIME FUNDS FOR ANNAPOLIS, AA COUNTY: Gov. Larry Hogan’s office on Wednesday said it increased funding for an Annapolis crime-fighting initiative because of “the notable uptick in violent crime” in the city. Hogan’s office announced Monday it would send $3 million in state grants for programs aimed at combating the heroin epidemic, including the “offender-based” Safe Streets Initiative. The largest Safe Streets grant went to the Annapolis Police Department, which received $345,147; Anne Arundel County’s $289,807 award was the second biggest on the list, which included nine jurisdictions, reports Megan Brockett in the Annapolis Capital. ON BENTLEY: In a very personal piece for MarylandReporter.com, Blaine Taylor, Helen Bentley’s former press secretary and former rival, recalls his years with the congresswoman, and the hard driving lawmaker that he knew. REPUBLICAN MORELLA BACKS CLINTON: Connie Morella, a former Republican congresswoman from Maryland, endorsed Hillary Clinton’s presidential campaign on Wednesday, the latest GOP figure to either back the Democratic nominee directly or beg off Donald Trump, John Fritze reports in the Sun.